I read this book in a pretty edition with a cover made of pink jouy canvas, pages cut by the previous reader in 1928! 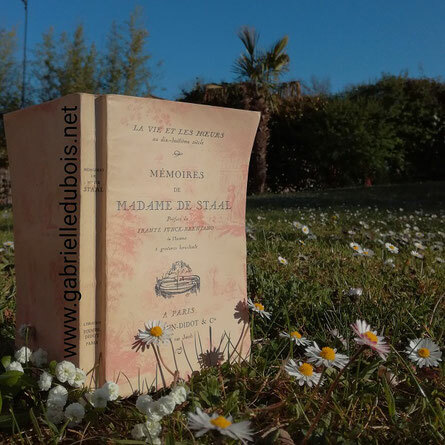 The writings that Madame de Stael left us are precious and I personally need them! Moreover, Mme de Stael would deserve a greater place in the French high school textbooks. But how could she get it while the place made to women authors in these texbooks, all editions combined, is 8% or even less, 2%! Yes, so little, I counted. Anyway! Have I been asked whether it is appropriate, in the 21st century, to give as an example to both girls and boys, of women's thoughts and views? No! So what do I bother, right? Whether I write a dithyrambic review of this fabulous author, Madame de Staal; or write that she was extraordinarily intelligent; or that she wrote marvelously well; or that she had a strength that few of us can boast of having; or that her humor is not to be neglected; or that she alone had learned the values of life by the lessons she had received; or that we have so much to learn from such an author; would all this get her the place she deserves in the French literary textbooks? No! No, because I’m told: But there were so few women who were allowed write, that it is normal they are little taught to nowadays students! And I answer: First of all, female authors were not so few. Second, the quantity of their writings is of such quality, would be of such a contribution for the generations of women to come, that it is truly damaging and inexcusable that they are not taught. But I still go astray, when I am only here to tell you about Mme de Staal's Memoirs, which she stops abruptly in this book when she is twenty. It pleased me so much to read these Mémoires that I would have liked them to continue the next thirty years of its author! One learns a great deal about the relations between dukes, counts and other self-declared "important people", with those who, like the author, were neither so rich nor so important: it is a beautiful ethnological journey that Mme de Staal highlights so finely. And also, this early life of the author is already a story of love and adventure, mixed with an exciting political intrigue! It is finely and firmly written, pleasant, fine, light, true, sincere, in short, it is a literary model. Well, I say it: I'm a fan!